In the last few weeks, NBA fans and analysts have been watching every step of the Sacramento Kings prospective sale to a Seattle-based investment group. This could obviously resurrect the Supersonics, who left Washington state for OKC and became the Thunder. 1. The Sacramento Kings were born as the Rochester Royals in 1945, joining the NBA in 1948. They later moved to Cincinnati, then Kansas City, where they became the Kings. It wasn't until 1985 when they arrived in Sacramento. The team has been owned by the Maloof family since 1999, who once owned the Houston Rockets. 2. Last week, the Kings were officially sold to the Seattle-based group, headed by Chris Hansen and Steve Ballmer. The sale price was $525million and is still awaiting approval from the the NBA Board of Governors. 3. 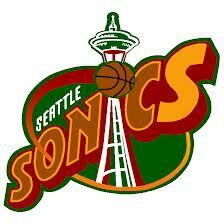 The Seattle Sonics were owned by Howard Schultz, the owner and founder of coffee giant, Starbucks. He sold the Sonics in 2006 for $350million. The new owners took them to Oklahoma City. 4. Seattle lost their beloved Sonics, partially resulting from local politics between city elected officials and team ownership. Talks over a new stadium failed and the Sonics were no more. 5. Chris Hansen has secured a workable deal for a stadium, so the issues Schultz had--paramount to losing the Sonics--shouldn't be present this time around. 6. Team ownership in general is prospering. Because of the rise in DVR use, games are the few programs viewers just don't miss. They record the reality shows, and watch the games. This puts more money in owners' pockets, as advertising and television deals are stronger because of the guaranteed viewership. Additionally, athletes are becoming brands of their own, with endorsements in industries other than sports. When athletes show up in areas outside of sports, it brings those consumers back to the sports market. 7. As a result of last season's league lockout, shares for owners are on the incline. 8. Seattle has been touted a better fan base for an NBA team. The region was immensely supportive of the Sonics when they were there, and compared to Sacramento, they will have much more attention solely on them. In Cali, the Kings have to compete with 3 other teams in the same league. Basketball doesn't have this conflict in Washington. 9. Sacramento Mayor and retired NBA player Kevin Johnson is doing all he can to keep the Kings, including work on a finance package for a new arena. 10. LeBron James doesn't like it. His sentiments, especially after being brought to the forefront, could be shared by other players as well. We will absolutely be watching this deal step by step.